Lafayette Class Ballistic Missile Submarine: Laid down, 5 March 1962, at Newport News Shipbuilding and Dry Dock Co., Newport News, VA.; Launched, 15 March 1963; Commissioned, USS James Madison (SSBN-627), 28 July 1964; Decommissioned, and simultaneously struck from the Naval Register, 20 November 1992; Final Disposition, disposed of through NPSSRP (Nuclear Powered Ship and Submarine Recycling Program), 24 October 1997, at Puget Sound Naval Shipyard, Bremerton, WA. Specifications: Displacement, Surfaced: 7,325 t., Submerged: 8,251 t.; Length 425'; Beam 33'; Draft 29'; Speed, Surfaced 16 kts, Submerged 21 kts; Depth limit 1,300'; Complement 140 (each crew, blue and gold); Armament, 16 missile tubes; four 21" torpedo tubes, forward, MK 14/16 Anti-ship Torpedo MK 37 Anti-Submarine Torpedo, MK 45 ASTOR Nuclear Torpedo MK 48 Anti-Submarine Torpedo ; Propulsion, S5W nuclear reactor two geared steam turbines, 15,000 SHP, one propeller. 275k James Madison was born at Port Conway, Va., 16 March 1751, and graduated from the College of New Jersey (now Princeton) in 1771. He was a member of the Virginia Council of State, and in 1780 became a member of the Continental Congress. An early advocate of increased Federal power under the Articles of Confederation, Madison served in the Virginia House of Delegates 1784-86 and was instrumental in securing passage of Jefferson's religious freedom bill. He played an influential role in the movement which led to the Constitutional Convention, drafted the "Virginia Plan" which became the core of that document, and worked tirelessly for its adoption. A first-rate thinker and writer on political theory and practice, he was the author of 29 of the famous Federalist Papers. Madison served in the House 1789-97 and proposed the first 10 amendments to the Constitution which became the Bill of Rights. Later, as leader of the Jeffersonian Republicans, he drew up the Virginia Resolves and condemned the Alien and Sedition Acts. 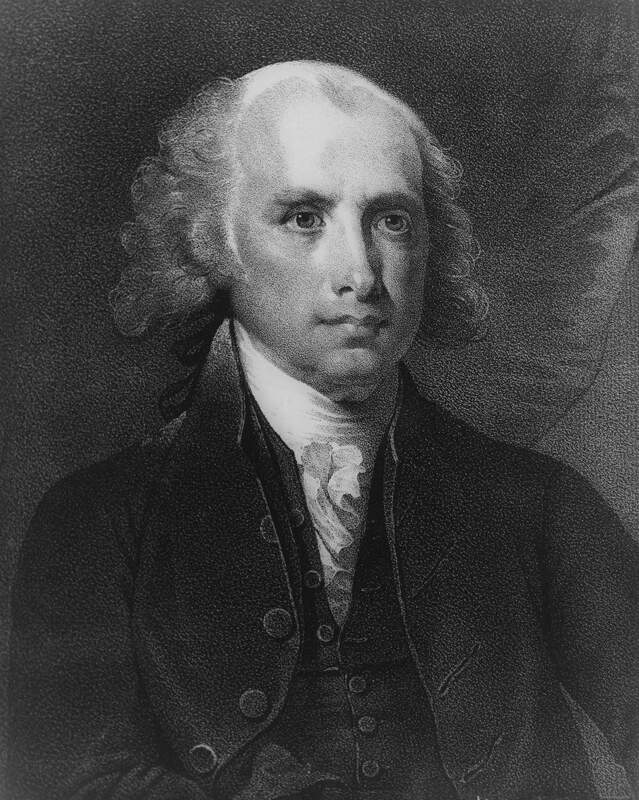 After being Secretary of State under Jefferson 1801-09, he was elected President. His first term was marred by the unpopular War of 1812 and his administration was marked by a trend toward nationalism. President James Madison, died 28 June 1836, but continues in fame as one of the Nation's most important thinkers and statesmen. Photo from the Library of Congress Prints and Photographs Division Washington, D.C. 20540 & submitted by Bill Gonyo. 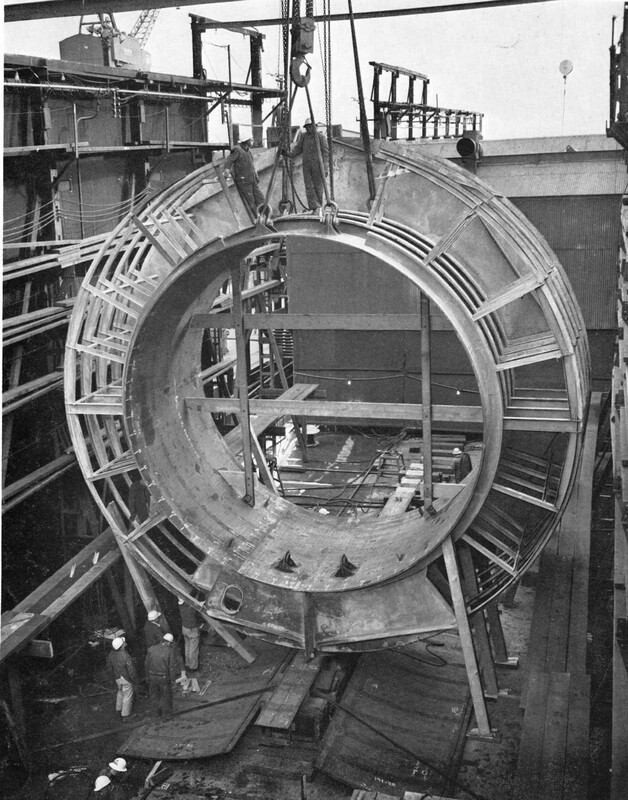 533k Keel laying of the James Madison (SSBN-627) on 5 March 1962 on the shipway vacated by the Thomas Jefferson (SSN-618). Newport News Shipbuilding and Dry Dock Company photo courtesy of Dale Hargrave. 88k Launching invitation for the James Madison (SSBN-627) on 15 March 1963. Photo courtesy of Dale Hargrave. 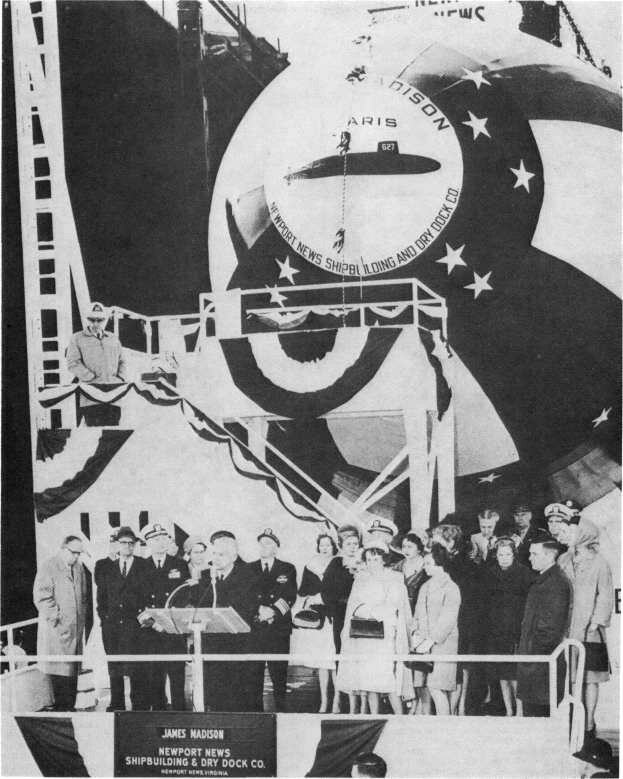 113k James Madison (SSBN-627) ready for launch with Secretary of the Navy Paul H. Nitze at the podium flanked by Admirals Galantin (left) and Grenfell (right) on 15 March 1963. Photo courtesy of history.navy.mil & submitted by Bill Gonyo. 585k THREE OF A KIND-And an ace hidden in the hole. 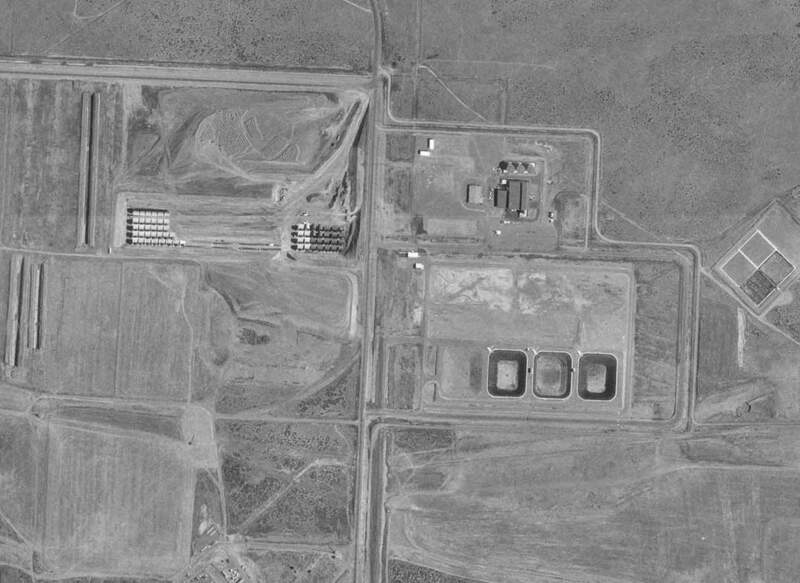 A trio of Polaris submarines poke their noses over the edge of their building ways while another while another lies hidden at extreme right. 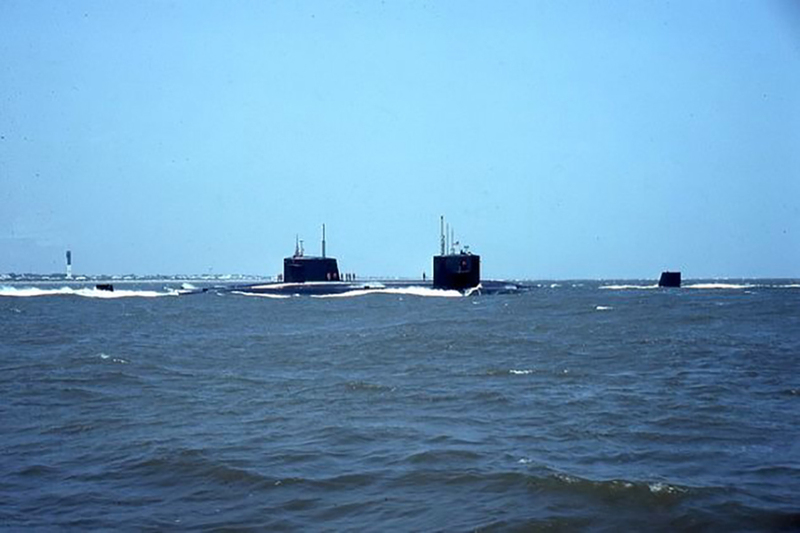 Photo was made just before James Madison (SSBN-627) (center) was launched yesterday, 15 March 1963. 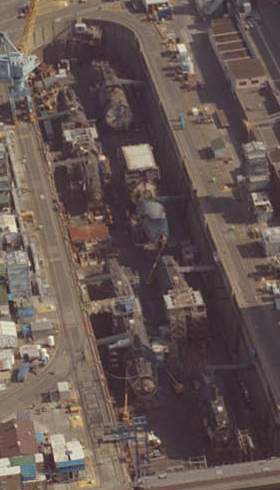 At left is the Von Steuben (SSBN-632) and at right is the John C. Calhoun (SSBN-630). 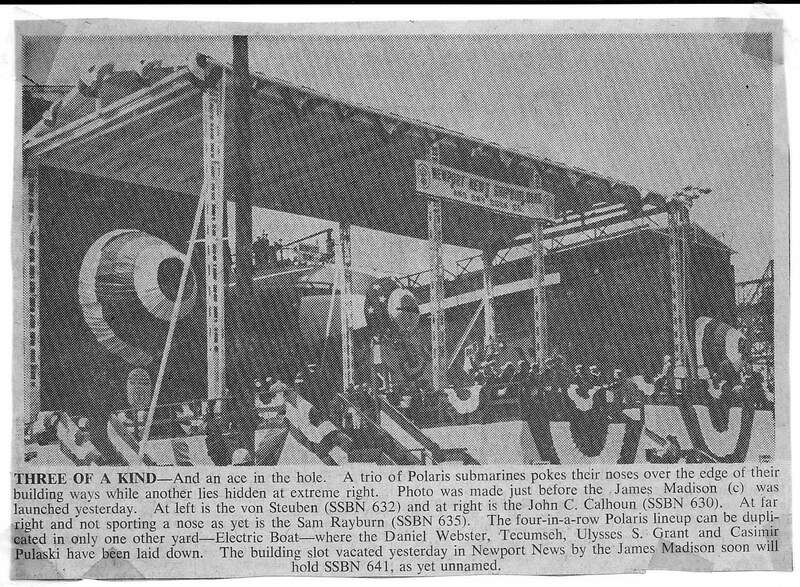 At far right and not sporting a nose as yet is the Sam Rayburn (SSBN-635). 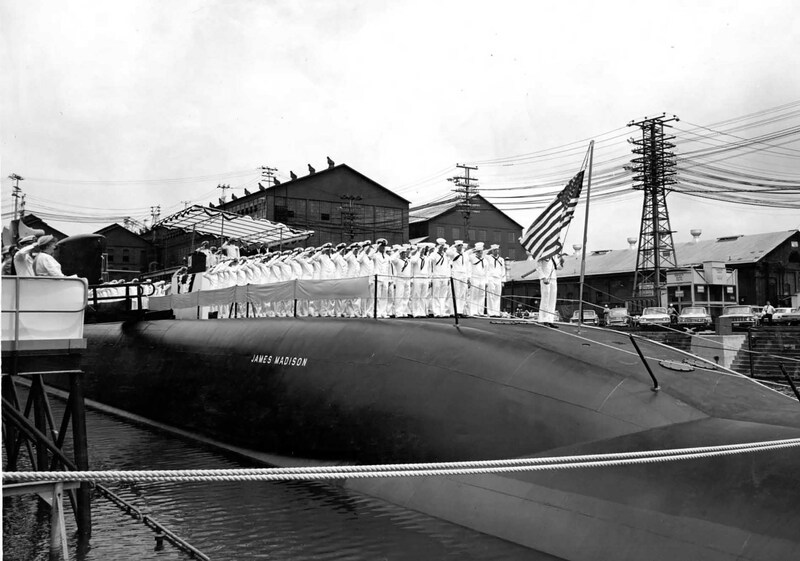 The four-in-a-row Polaris lineup can be duplicated in only one other yard-Electric Boat-where the Daniel Webster (SSBN-626),Tecumseh (SSBN-628),Ulysses S. Grant (SSBN-631) & Casimir Pulaski (SSBN-633) have been laid down. 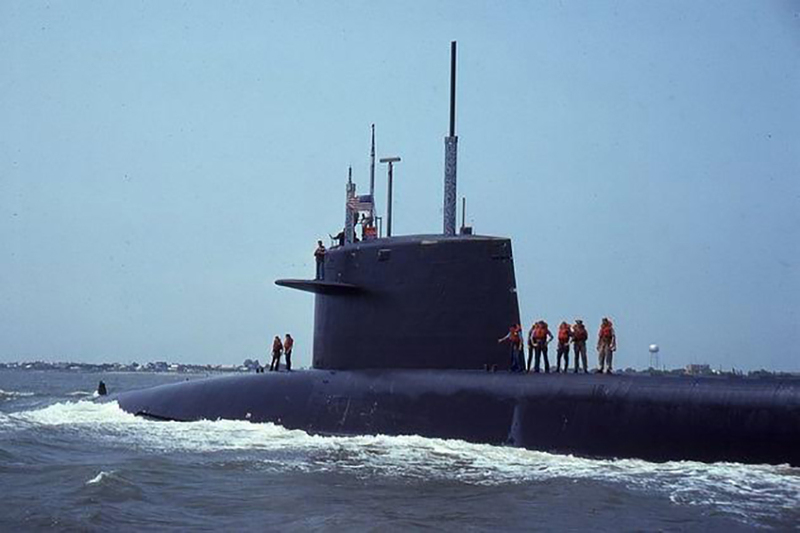 The building slot vacated yesterday in Newport News by the James Madison soon will hold (SSBN-641), as yet unnamed. Photo courtesy of Dale Hargrave. 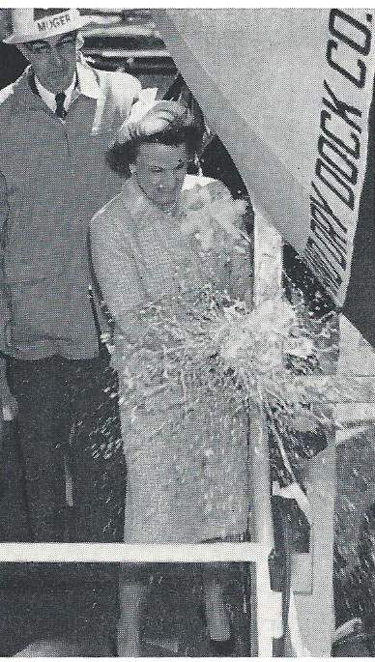 555k Mrs. A. S. Mike Monroney, wife of the Senator from Oklahoma, christens the James Madison (SSBN-627). Photo courtesy of Dale Hargrave. 261k James Madison (SSBN-627) is crowned by Mrs. A. S. "Mike" Monroney, wife of U.S. Senator Monroney of Oklahoma. USN photo courtesy of Scott Koen & ussnewyork.com. 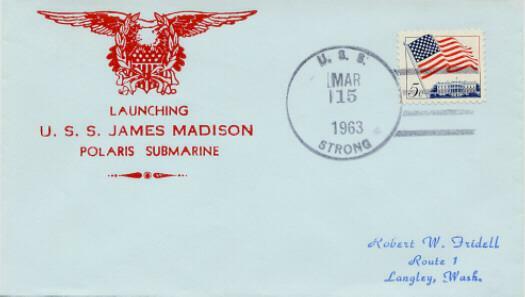 16k Commemorative post card marking the launching of the James Madison (SSBN-627), 15 March 1963. Photo courtesy of Richard Leonhardt. 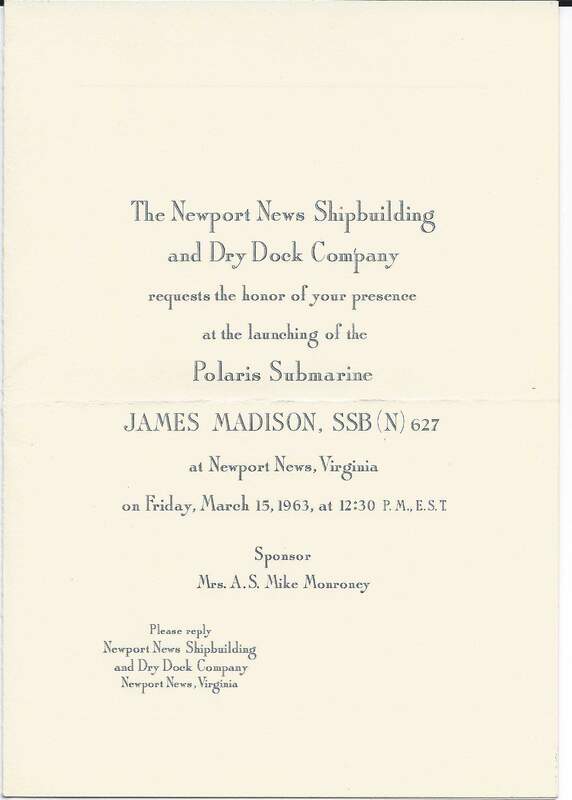 88k The James Madison (SSBN-627) Launch Invitation, 15 March 1963. Photo courtesy of Dale Hargrave. 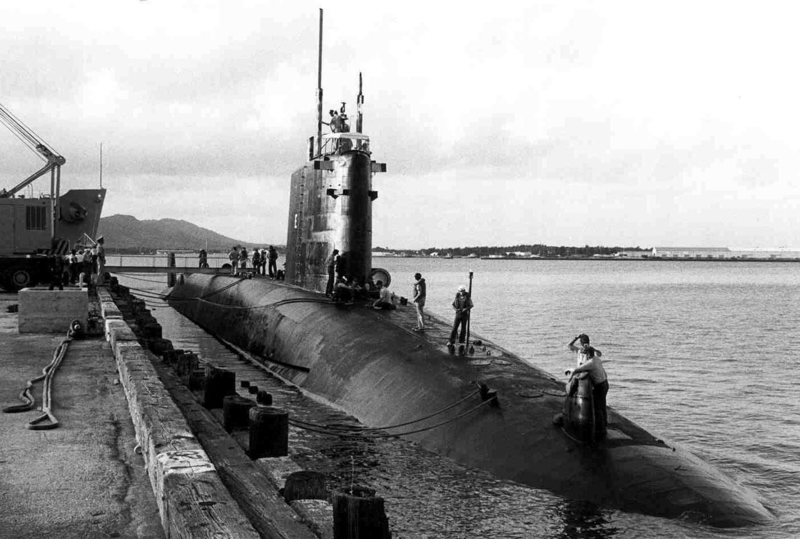 508k James Madison (SSBN-627) at rest following her launching on 15 March 1963. USN photo # NPC 1073876 courtesy of Scott Koen & ussnewyork.com. 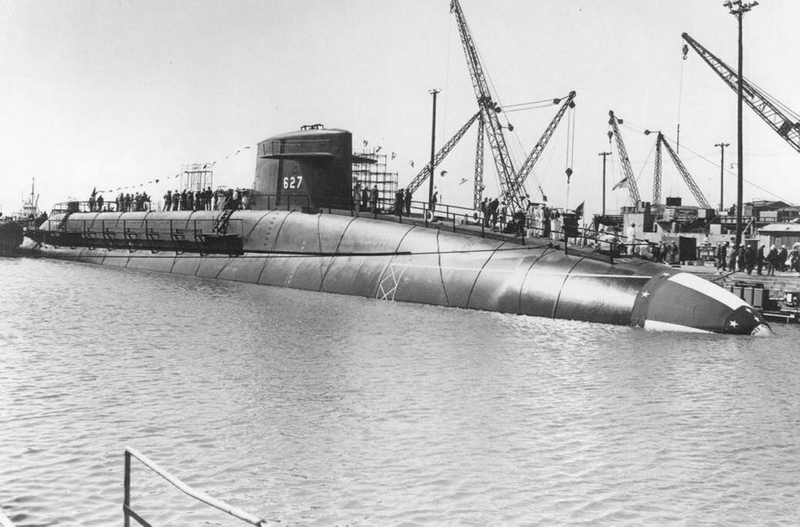 3.40k Launching Pamphlet of the James Madison (SSBN-627) on 15 March 1963. PDF courtesy of Darryl L. Baker. 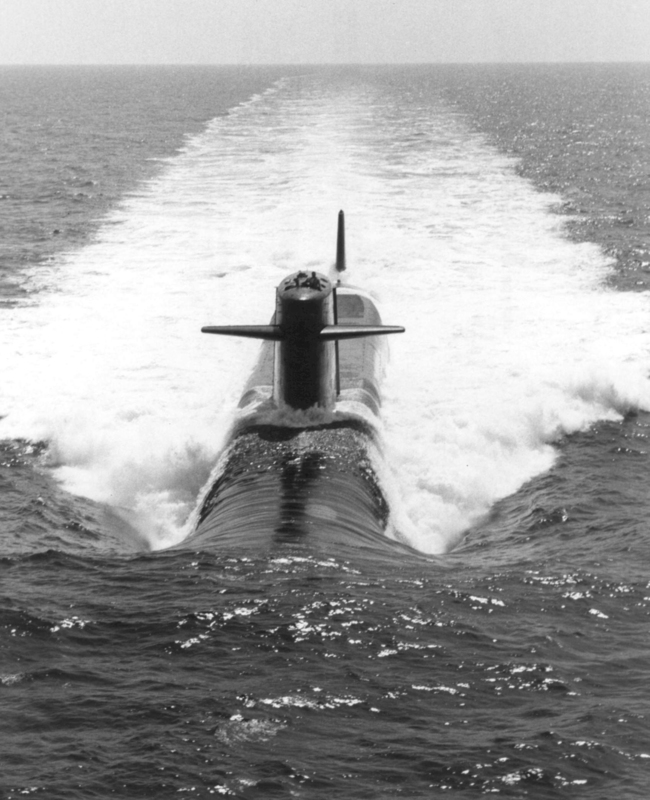 1.30k Bow on view of the James Madison (SSBN-627) on 2 July 1964 during her trials. USN photo # NPC 1103855 courtesy of Scott Koen & ussnewyork.com. 642k James Madison (SSBN-627) heads North during her trials in 1964. USN photo courtesy of Scott Koen & ussnewyork.com. 201k Commissioning ceremony of the James Madison (SSBN-627) at the moment the flag was raised, formally placing the ship in commission. 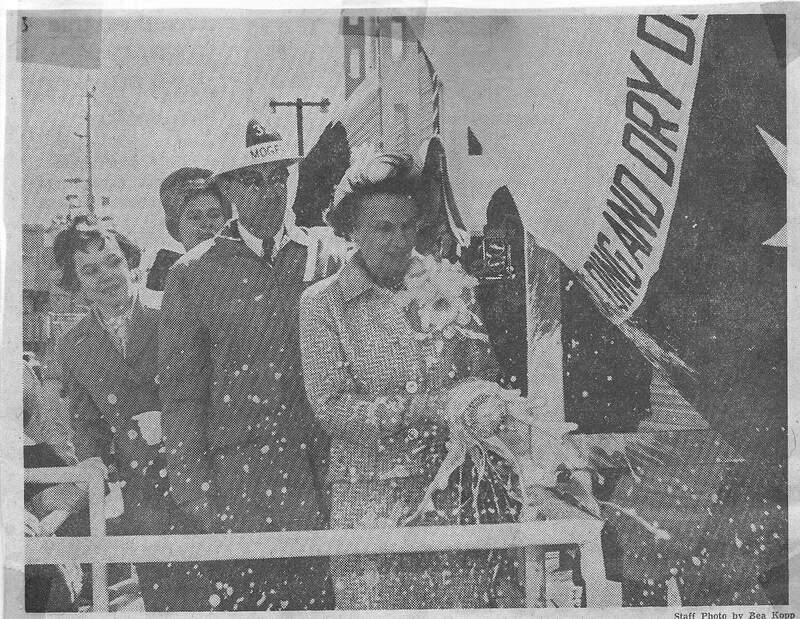 The event took place at the Newport News Shipbuilding and Dry Dock Company on 28 July 1964. Photo courtesy of Dale Hargrave. 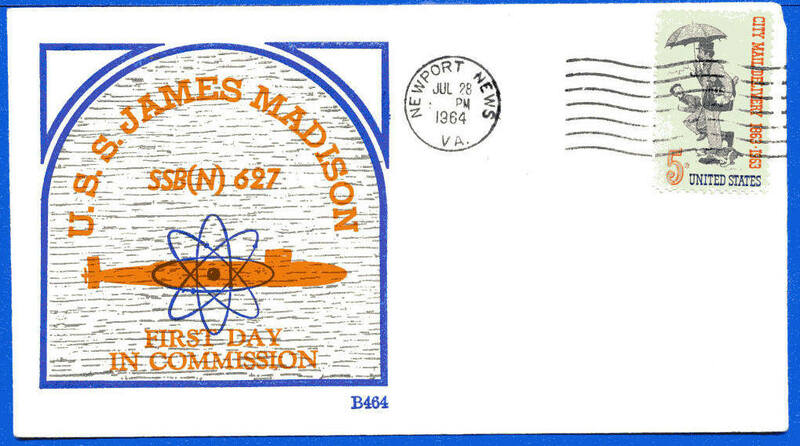 123k Commemorative post card marking the commissioning of the James Madison (SSBN-627), 28 July 1964. Photo courtesy of Jack Treutle (of blessed memory). 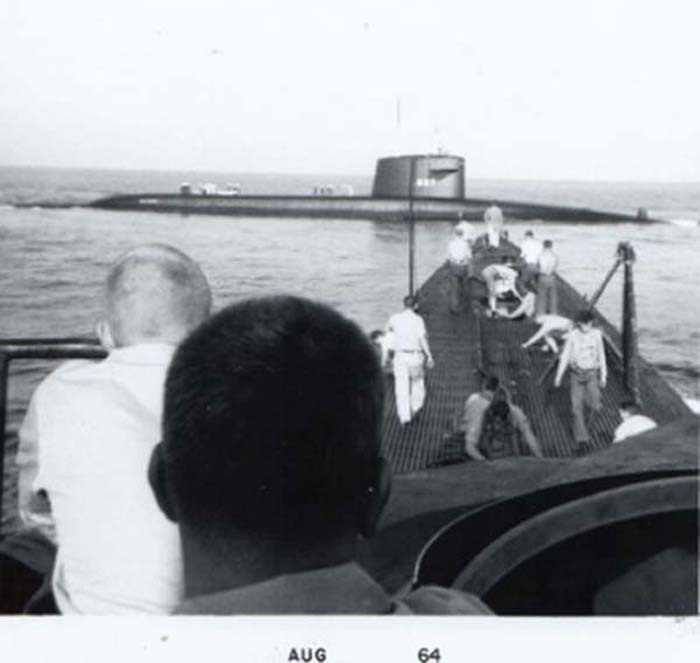 75k Photo from the deck of the Redfin (SS-272) in the VA. CAPES OP area off Virginia, August 1964. 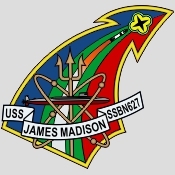 The James Madison (SSBN-627) crosses Redfin's (SS-272) bow. Photo courtesy of John Hummel, USN (Retired). 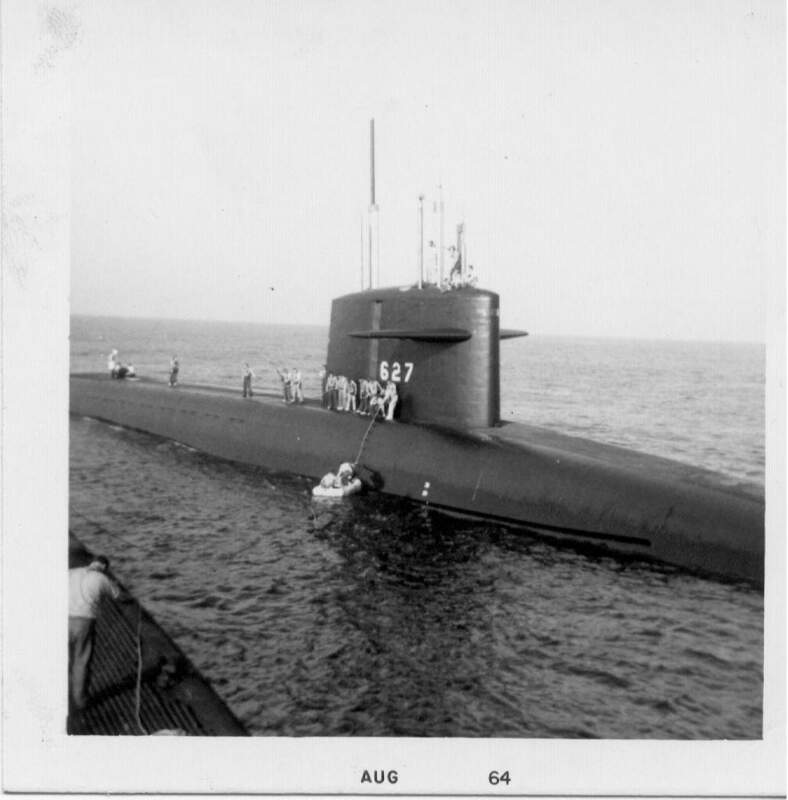 75k Photo from the deck of the Redfin (SS-272) in the VA. CAPES OP area off Virginia, August 1964. 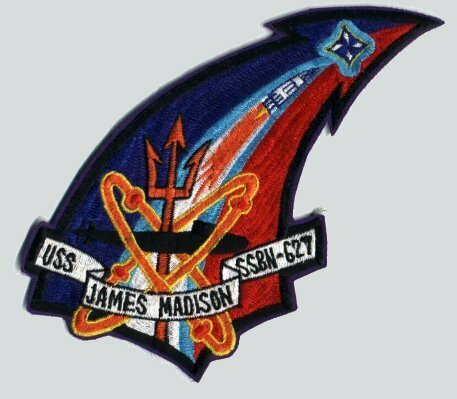 The James Madison (SSBN-627) fired a MK-14 torpedo at us, and we recovered it, then some of our guys went over in small rubber boat to ride her for a while. Photo courtesy of John Hummel, USN (Retired). 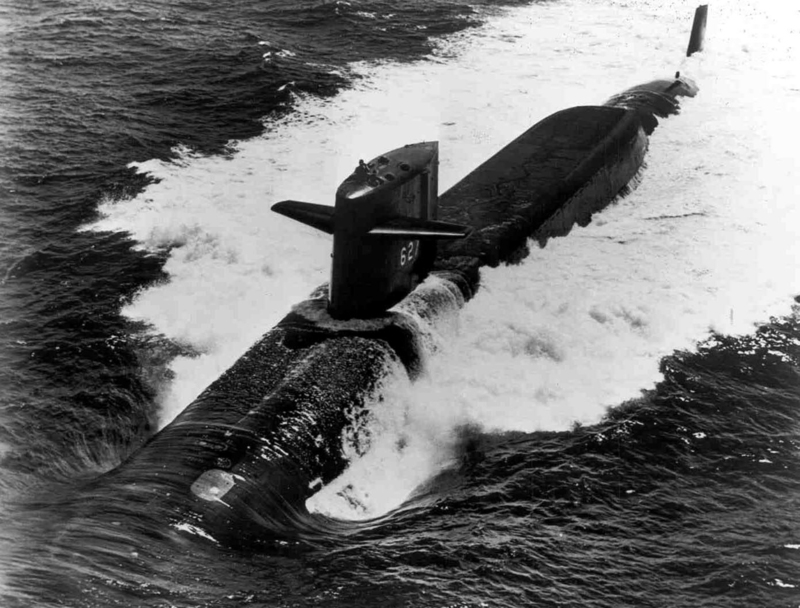 270k The James Madison (SSBN-627) submerges to begin the process of test-firing the first Poseidon SLBM off Cape Canaveral in the summer of 1970. This image was taken from the surveillance trawler Khariton Laptev (SSV-503). 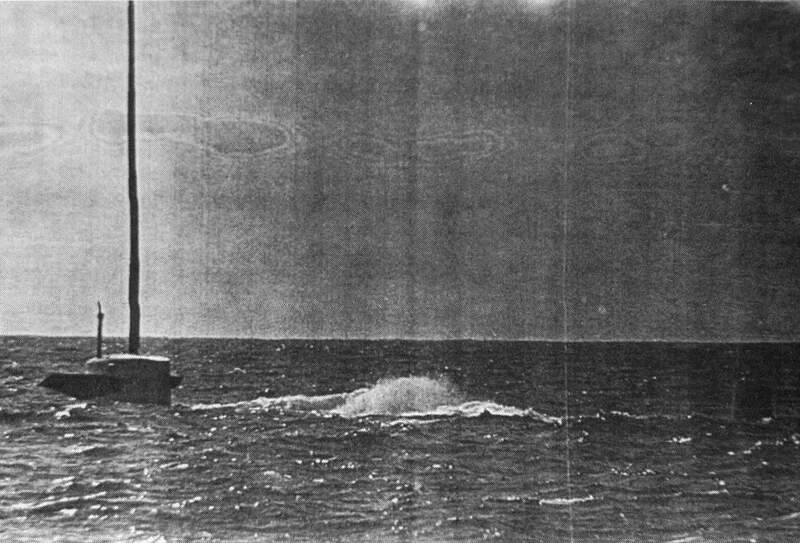 Photo courtesy of Rear Admiral Gleb P. Kondratiev, taken from "Rising Tide" by Gary E. Weir and Walter J. Boyne.& submitted by Robert Hurst. 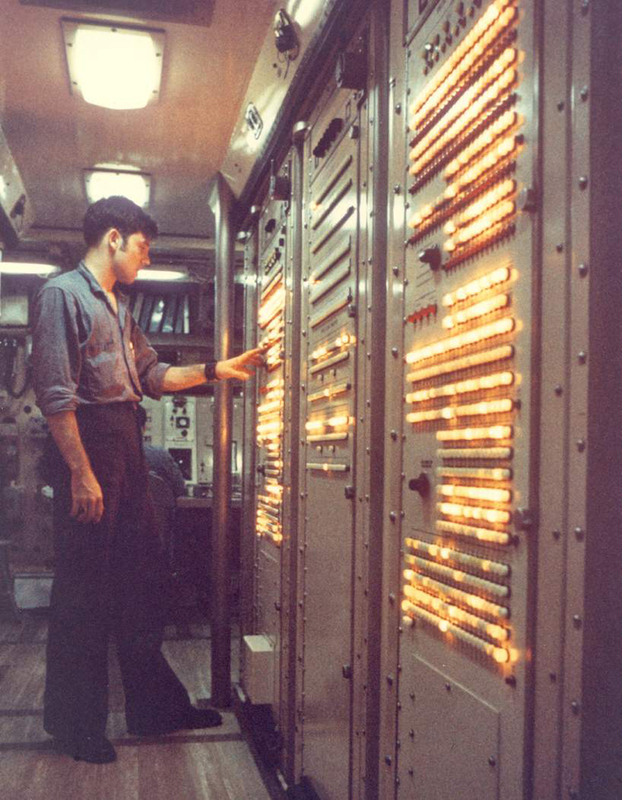 830k These bright lights make other bright lights on the James Madison (SSBN-627), November 1970. USN photo # NPC K-87041 courtesy of Scott Koen & ussnewyork.com. 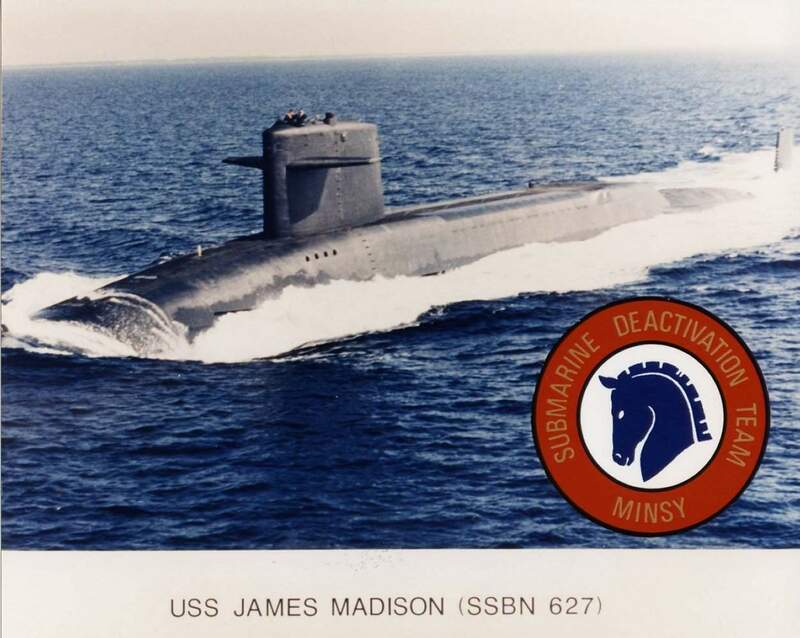 629k The E is marked on James Madison (SSBN-627). USN photo courtesy of Scott Koen & ussnewyork.com. 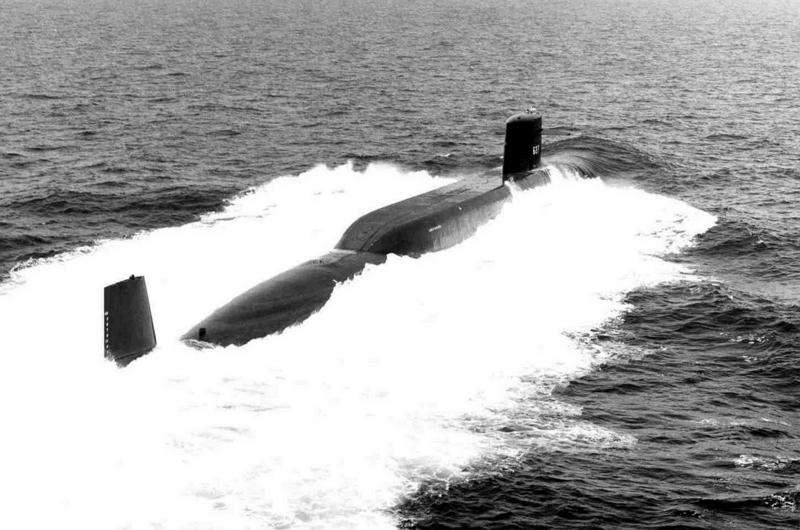 678k James Madison (SSBN-627) sails the ocean blue (even in b&w) in 1972. USN photo courtesy of Scott Koen & ussnewyork.com. 230k Batfish (SSN-681) going to sea from Charleston SC., June 1976. Passing inbound James Madison (SSBN-627). Photo courtesy of Rick Morgan. 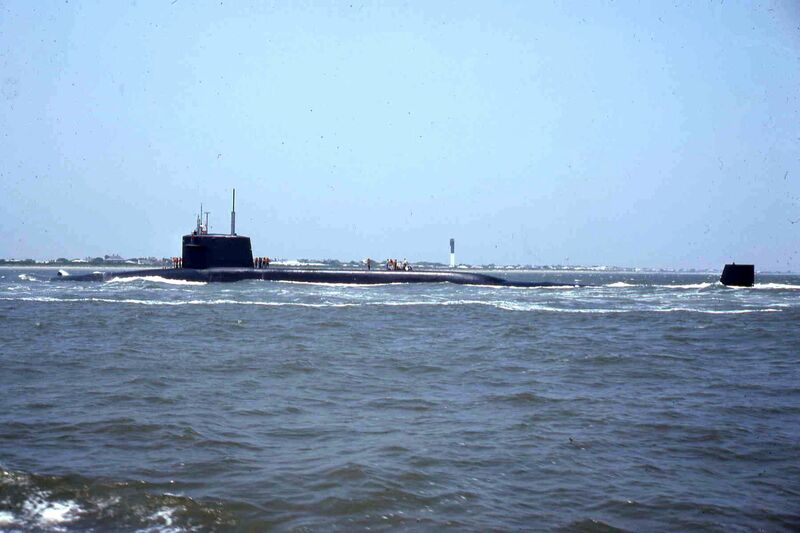 215k Two views of James Madison (SSBN-627) in the Cooper River off Charleston, S.C., June 1976. Photo courtesy of Rick Morgan. 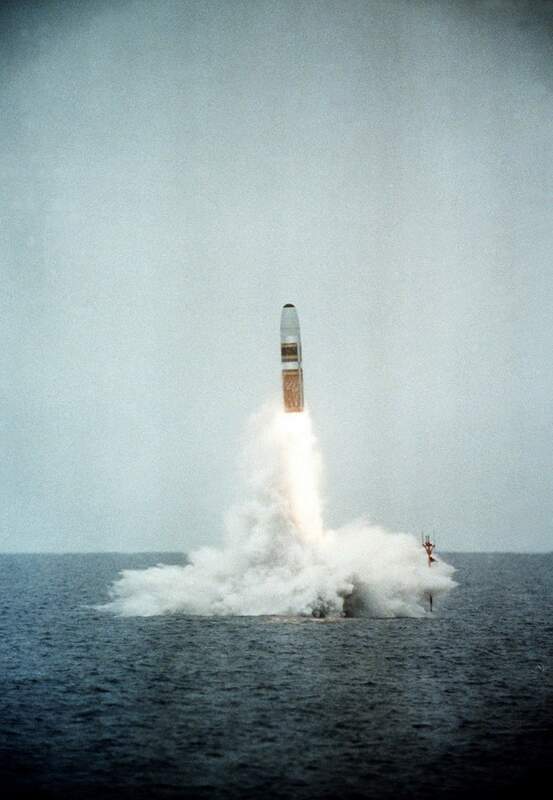 415k A view of the 13th demonstration and shakedown operation launch of a Trident I missile from the nuclear-powered strategic missile submarine James Madison (SSBN-627), 5 June 1982. Defense Visual Information Center photo # DF-SC-83-06049, from the Department of Defense Still Media Collection, courtesy of dodmedia.osd.mil. 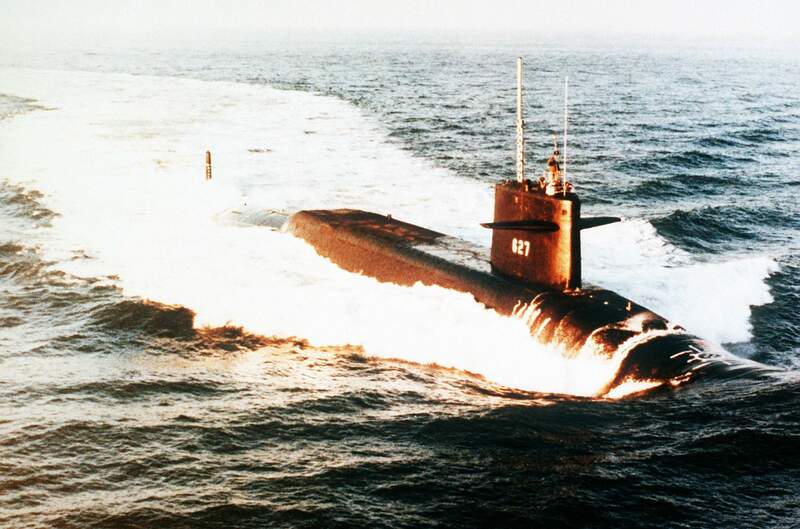 703k A starboard bow view of the nuclear-powered ballistic missile submarine James Madison (SSBN-627) underway, 17 January 1986. 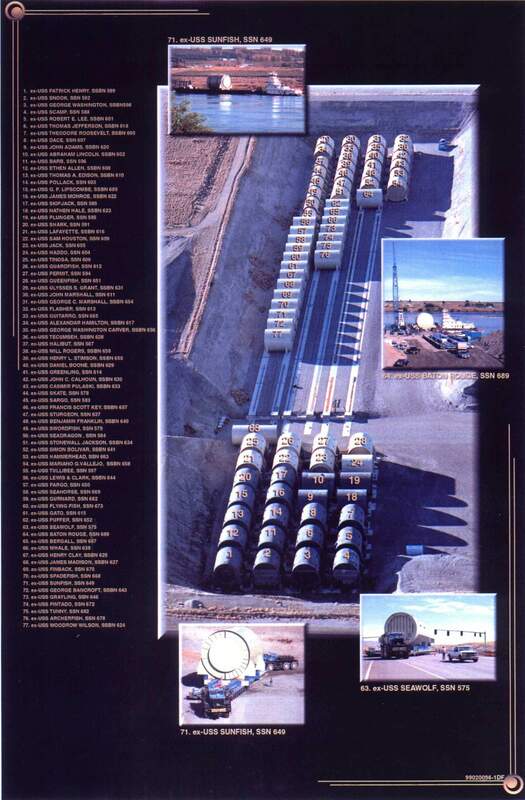 Defense Visual Information Center photo # DN-SC-86-02379, from the Department of Defense Still Media Collection, courtesy of dodmedia.osd.mil. 121k This photo was issued by the James Madison (SSBN-627) and the Mare Island Project Team to mark the inactivation of the ship at Mare Island. She was inactivated at the yard from 18 February 1992 until 8 December 1992. USN photo courtesy of Darryl L. Baker.